If you're even thinking of being in Southeast Alaska, check out the rest of our DestiNATION Juneau travel guide. It's stacked with expert advice from locals on where to eat, what to bring, where to stay, and how to fully unlock the wild adventures that await you. In September -- as soon as the Alaskan air drops below 50 degrees Fahrenheit -- racers who’ve qualified for the 2019 Iditarod begin their training. For Blair Braverman, a writer and musher entering the race for the first time, this involves moving to Alaska. Training -- usually five days a week -- starts out with 5-mile-ish runs in September. By December, they’ll be doing more like 40-mile sessions. The Iditarod, which follows a 1,150-mile route from Anchorage to Nome, is in March. Braverman and her team don’t know yet which dogs will make the final roster, so they’re bringing all of them -- around 20 adults and 10 puppies. 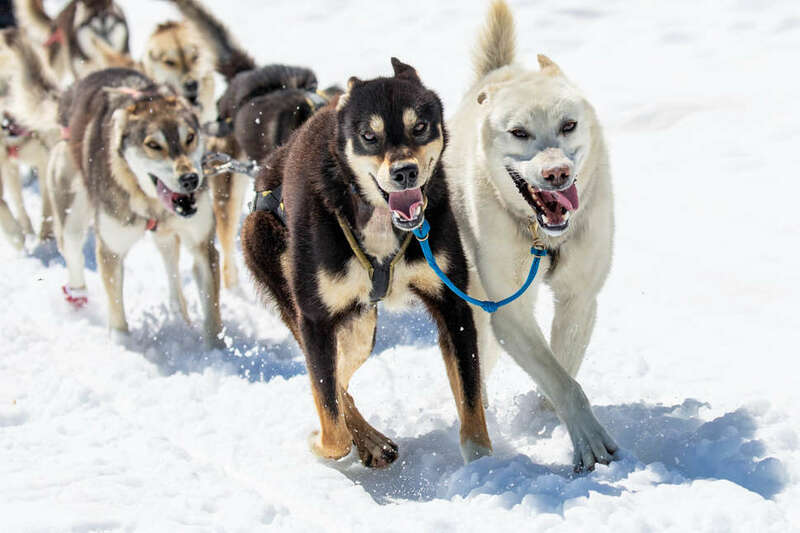 While the Iditarod is indeed the ultramarathon of dog sledding, there are plenty of mushing expeditions of the fun and chill variety that visitors can take advantage of on their trip to Alaska. If you love dogs -- and to be clear, I am talking here not about those weird yappy ones that weigh nine pounds and quiver when touched by a modest breeze, but about full-sized, snow-loving Good Dogs -- there’s nothing that compares to a mushing tour. 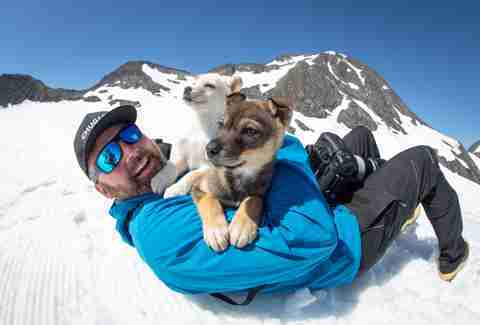 Do you want to cuddle smol huskies atop a glacier, onto which you will be delivered by helicopter? Would you like to meet Iditarod racers and feel for yourself what it’s like to climb aboard a sled and attempt to slow a team of dogs so pure of heart their only desire is simply to run? All of us here at Thrillist would hope so, but either way you clicked on this so that’s a start. We can work with that. What are the best places for tourists to go mushing in Alaska? If you’re in a position to splurge, book a heli-mush tour -- that means you start off with a helicopter ride that’ll take you a remote location, and then you’ll get mushing. Braverman’s top recommendation is Alaska Heli-Mush. This one stands apart from most others because you have the option to actually drive the sled yourself instead of being a passenger the whole time. The tour is for folks of nearly all ages and abilities -- you’ll need to be able to maneuver in and out of the helicopter, but the company says it’s had happy customers who were blind, amputees, or in their 90s. It takes three hours from start to finish -- you’ll spend about an hour at the dog sled camp, half an hour sightseeing from the helicopter in each direction, and about an hour dog sledding. On the flight up to the Taku Glacier, which is, by the way, one of the few in the world that’s still advancing -- sometimes up to 100 feet in a single year -- keep an eye out for mountain goats, bears, moose, and yetis. Soon you'll touch down into “Dog World,” where 200 sled dogs await. Tours are $599 per person, but it’s worth paying $750 for the Extended Adventure -- in that option, smaller groups learn how to harness and drive the dogs, then mush them several miles with the guide. Then you’ll visit the crew’s camp, where you’ll learn all about caring for the dogs -- and you get to feed them snacks. 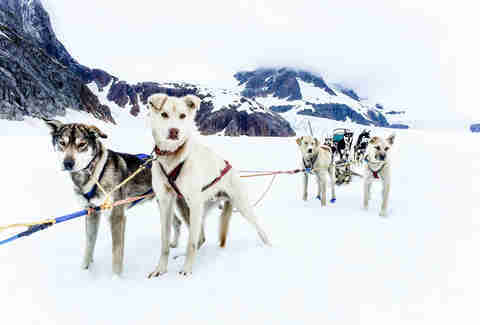 The Juneau tour from Alaska Shore Excursions ($529; $629 for those over 280 pounds) will pick you up at the cruise ship port (for free), fly you by helicopter over Mendenhall Glacier and the Juneau Icefield (about 25 minutes), then set you down amongst 80 Very Good Dogs. 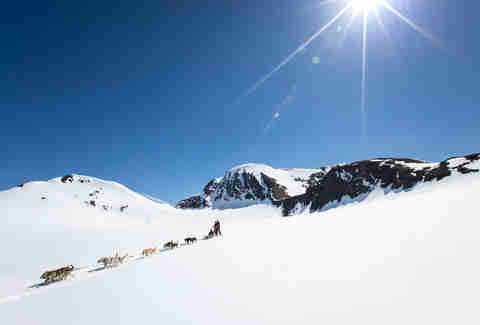 The tour takes three hours total, with one hour of that being at the camp and about 40 minutes of actual dog sledding. Did we say most tours wouldn’t let you drive the sled yourself? Because this is another one where you very much can if you wish to (which you do, yes?). You’ll also get the chance to meet Iditarod competitors and sled dog trainers, and ask them how it is possible that their dogs are so Good. Look for Alpine Air Alaska’s tour of the Punch Bowl Glacier -- a helicopter ride to a snowfield 3,200 feet above sea level. This one costs $529 per person ($499 for kids 12 and under). 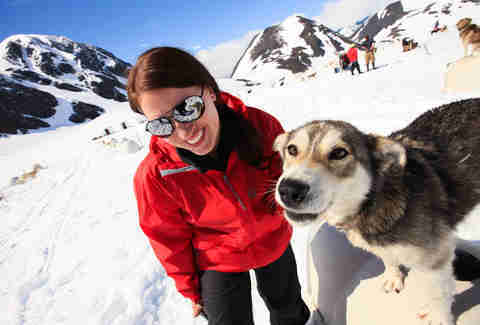 The tour takes about 2 1/2 hours, including the helicopter time -- you’ll spend about an hour and a half up on the glacier itself, where you’ll play with puppies and of course climb aboard a sled with a guide who’ll drive the big dogs across the snow. Be prepared for dogs that don’t want to stop (in a good way) any more than you do. Check out Jeff King’s Husky Homestead in Denali if you want a closer view of the mushing world but don’t actually want to get on a sled yourself. King is a four-time Iditarod champion (the “winningest musher in the world”), so you’ll be seeing the real deal up close. And you will probably get to hold incredibly cute puppies. It’s going to be even colder -- probably at least 10°F colder -- on a glacier than in a coastal city like Juneau, so you want layers and lots of ‘em. You can probably get away with jeans if you don’t freeze easy, but you definitely want a windproof, waterproof jacket, and snowpants wouldn’t hurt either. Footwear will be provided, but you’ll still want something warm and waterproof just for getting around. If you’ve ever been skiing or snowboarding, the uniform is basically the same. What’s the best time of year to go dog sledding? Summer, which might sound counterintuitive, but summertime is offseason for sled dogs, so tours are how they play around and stay active. Summer camp for racing dogs -- doesn’t that sound fun? There are of course dog sled tours in the winter, too. More on those in a sec. Show up early, so you get to watch the teams set up -- champions and rookies alike. Also so that you can get a seat at a bar to watch them go by, if that’s your jam. Bring cash for the hot chocolate and such that you’ll likely see for sale. Do NOT bring your dog -- this is not a pet-friendly zone -- but definitely do bring your kids. There’s also an auction for sled rides with each team. A big part of volunteering is taking care of dogs that are dropped from the race. Each competitor starts with a team of 16 dogs and must finish with at least five; racers will leave dogs at checkpoints if they’re tired and don’t want to continue. Other times volunteers might do radio communication, or be stationed at checkpoints, or at a bonfire at a road crossing so that when teams come out of the forest you’re there to make sure they don’t get hit by cars. To volunteer, you usually just show up a day early and complete a training session to learn how to approach a dog team and how to be up close with the dogs and mushers. It is more competitive than usual to get in as a volunteer for the Iditarod itself, so consider getting there farther in advance if you can swing it.